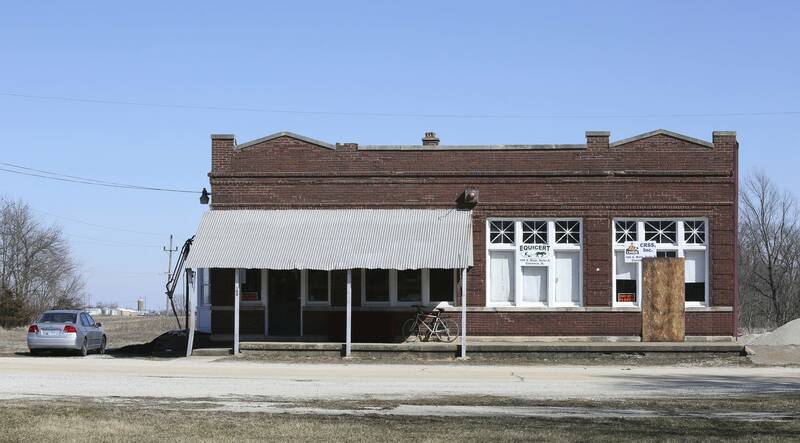 As the FBI and local enforcement zeroed in on a group of central Illinois men suspected of bombing a Bloomington mosque, the men pleaded for other militia members to help "guard" their rural town of a few dozen people. 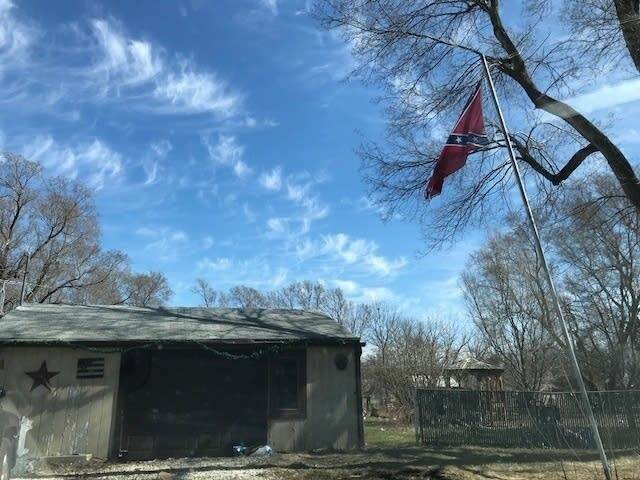 "Please come and support us in Clarence, Illinois," their leader, who appears to be Michael B. Hari, said in a video posted on March 4. "We need people to stand with us and win back our liberty." Hari then got up from the desk and another masked man took his spot. "I request for more militia to come and help us, take our town back," the man said. 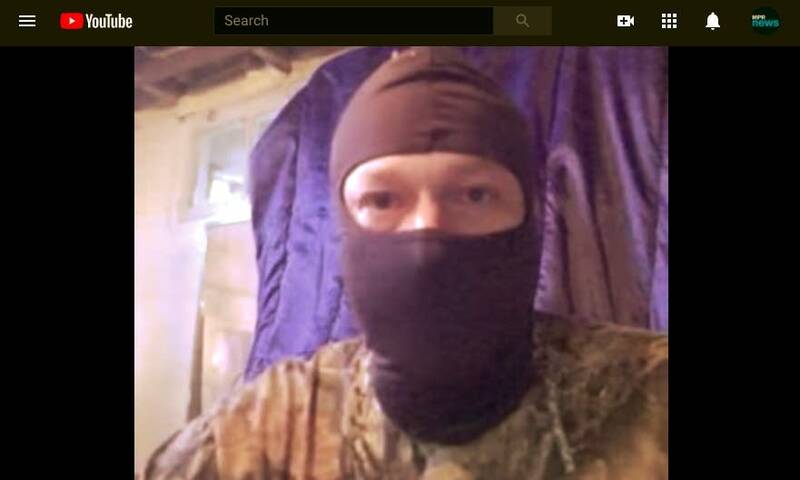 "To our militia brothers out there, please come help," a third masked man said. A week later, the FBI would round up all three men and charge them with "using an explosive device to maliciously destroy and damage" the Dar al Farooq Islamic Center in Bloomington, according to the U.S. Attorney's Office in Minnesota. While Hari and the rest of the men were masked in the YouTube videos, their statements aligned with the details of the FBI's investigation into the men and other facts laid out in charging documents reviewed by MPR News. Hari, 47, Michael McWhorter, 29 and Joe Morris, 22, drove more than 500 miles to bomb the mosque last August in an attempt "to scare [Muslims] out of the country," McWhorter told an FBI agent. 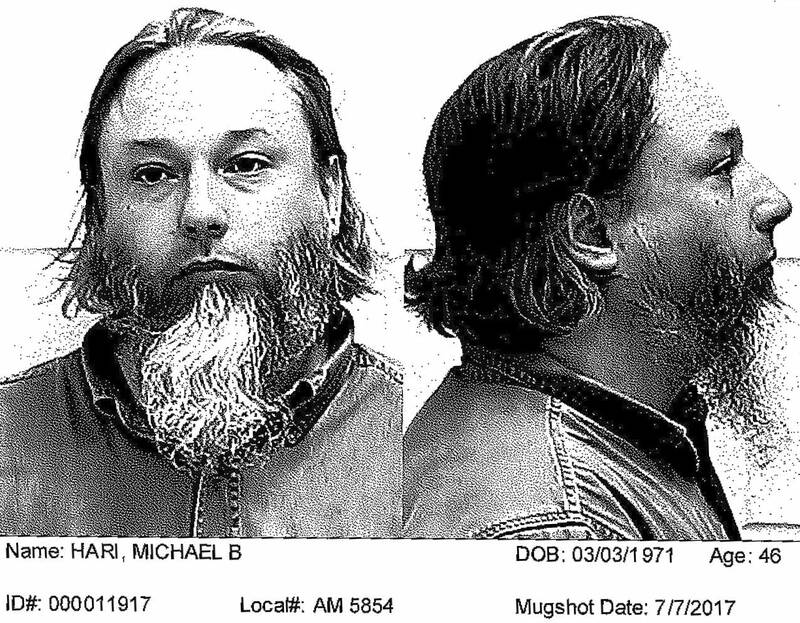 Hari, the leader of a group called "White Rabbit Militia — Illinois Patriot Freedom Fighters, Three Percent," was supposed to pay $18,000 to Morris and McWhorter for their participation in the bombing, according to court documents. It's still a mystery why the men would drive more than seven hours through the night to target the Bloomington mosque. In a series of YouTube videos posted to a channel called "Illinois Patriot" in the last two months, Hari expressed his contempt for the Illinois Department of Child and Family Services, espoused anti-government views and said it's "time for resistance." Hari, who worked as a correctional officer and a deputy sheriff for Ford County in Illinois in the 1990s, claimed that the FBI, NSA and academia are in the hands of the Democrats. "Is there anything left that they could take from us?" he said in one the videos. "Oh, you say, 'we still have our guns.' What good are they if they don't use them. The country is turned to a police state." "This government is completely illegitimate," he added. In a blog post on the mymilitia.com website, the group posted on Monday that they plan to protest the FBI and local enforcement's "abuse of the people in Clarence." "We'd like to tie the protest at Clarence to the Deep State activities such as mass data collection and the attempt of the FBI to wiretap the Trump campaign and interfere in the election," the post said. Hari, who grows watermelons and owns an agricultural food safety auditing business called Equicert, filed a lawsuit last month against the United States Department of Agriculture and the U.S. Department of Health and Human Services claiming that the federal government was damaging his business by engaging in "private business" and thus "transgress[ing] against the Constitution of the United States." "The People of the United States have rejected the Marxist doctrine that the government shall own the means of production, have fought and won an extensive Cold War against that doctrine," Hari wrote in the lawsuit. Hari recently created a global security firm in an attempt to bid for construction rights to build President Trump's proposed border wall along the Mexican border. In one of the YouTube videos posted on March 11, just two days before he was arrested, Hari said Trump's election victory was a "great thing." "I'm not sure that Trump is 100 percent devoted to what we are, but he seems like a good guy, seems like he's on our side," he said. "He's one man, he's at the top, he's all by himself. He's being resisted left and right by the Justice Department." This is not Hari's first time in the public eye. In 2006, a jury in Paxton, Ill., convicted him of child abduction for taking his daughters, then 15 and 13, to Mexico and Belize. According to news reports at the time, Hari feared he would lose custody of the girls to his ex-wife, Michelle Frakes of Peoria, Ill. The girls, Mollie and Allene Hari, were reunited with their mother after a private investigator working with the TV personality Dr. Phil tracked them to a German Baptist Church colony in Belize. Hari was sentenced to 30 months probation. The FBI's investigation into the men kicked into gear after an informant, who said Hari recruited him into the group, notified agents in January that he heard the group talking about how they threw a pipe bomb at the mosque. The informant, who received $1,000 from the FBI for providing the information, also reported seeing illegal firearms and explosive material known as Tannerite in the group's possession. On Feb. 13, another informant provided the FBI with pictures taken from the garage of Hari's parents that showed tools such as a drill that can be used in making a pipe bomb and a photo of the Anarchist's Handbook, which contains detailed instructions on making explosives. Six days later, the FBI and local law enforcement discovered multiple explosive devices in a Clarence home that included a pipe bomb attached to a small green propane tank. The person who resided in the home, named J.O. in court documents, told authorities that he believed Hari was "responsible for placing the devices on his premises." The informant took screenshots of McWhorter's Facebook page on Feb. 19. In one of them, McWhorter posted: "Clarence gonna be on the news again, this s--- is crazy man." One person commented on the post before it was deleted and asked: "Mike Hari?" In late February, McWhorter disappeared from his home after his wife told him that the FBI wanted to talk to him. When his wife asked where he went in her last conversation with him, McWhorter responded: "I can't tell you, I love you," according to a court document. A few days later, the masked men appeared on YouTube. "People have definitely been terrorized by the law enforcement response to this supposed pipe bomb situation," Hari said in a March 10 video. "We are calling out for freedom-loving people everywhere to please come and help us." He said the FBI had "run wild over a whole town." Three days later, FBI agents arrested Hari, McWhorter and Morris. MPR News reporter Matt Sepic contributed to this report.